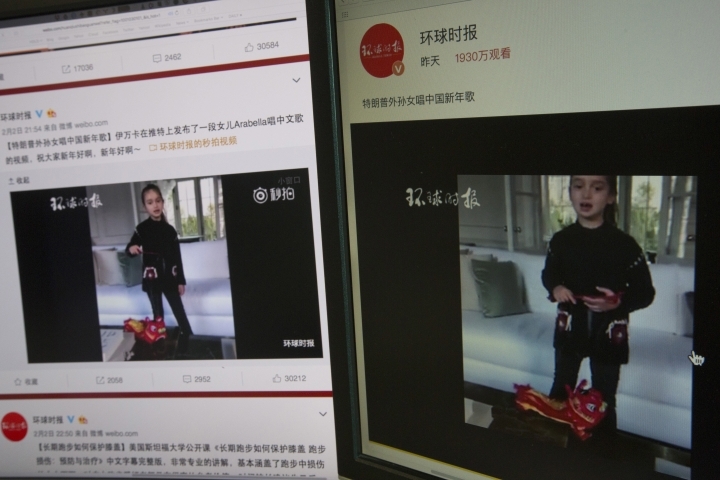 BEIJING — A brief video clip of Donald Trump's granddaughter singing in Chinese is circulating to strong approval on the internet in China, even while some criticized the U.S. president's failure to send greetings for the Lunar New Year. While the Trump women received praise, the lack of a greeting from the president "triggered heated discussion" among the Chinese public over the possible ramifications for bilateral relations, the official newspaper Global Times said Friday. The paper noted that Trump's most recent predecessors Bill Clinton, George W. Bush and Barack Obama "all delivered Lunar New Year greetings to Asians who celebrate this festival. "Some Chinese (internet) users felt Trump was being disrespectful by not sending a greeting," the paper said. China has rejected the accusations and has in fact been spending heavily from its pile of foreign currency reserves to prop up the value of its currency, which would make exports more, not less, expensive. On the streets of China's financial hub of Shanghai, residents were full of praise for Ivanka and her daughter, while mixed on the significance of the lack of presidential greeting. "A bridge of friendship is needed between China and the U.S.," said Chen Zhijun, 30, who works in gold sales. Not sending a New Year greeting, he added, "definitely is not helping. Maybe it is because he is new and has too much to deal with." "I'm glad to see his daughter and little granddaughter being friendship messengers ... it is a sign of being nice," Chen said. A 35-year-old bank worker who gave only her surname, Yu, said Chinese needed to shrug off any perceived slight and doubted whether the lack of a greeting would have any substantive impact. "We should have the mentality of a major country and have the confidence not to be bothered about this," Yu said.